Stain it, paint it, decorate it! Blick's unfinished wood frame is ready to complement your creative vision. Its sanded finish readily accepts stain, varnish, or paint. Or use it for mixed media art, crafts, or art projects of all kinds. The beauty of this frame is that you can transform it to suit any medium, style, or décor. 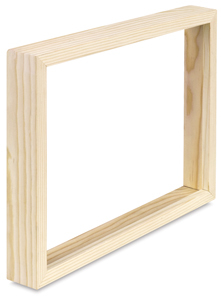 Made from unfinished pine sourced from renewable American forests, Blick's unfinished wood frame is 1½" deep, ideal for stretched canvases or for displaying your favorite work of art.